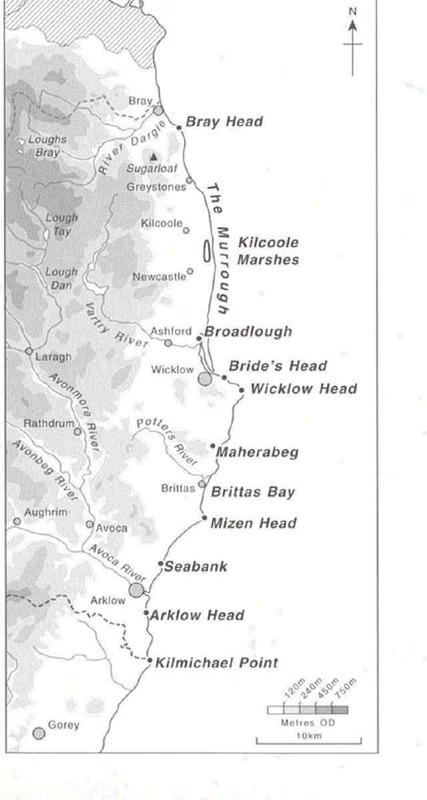 Main coastal features of County Wicklow. The northern half of the coast is dominated by the shingle barrier of the Murrough while the southern coastline is sandy with a series of rocky headlands. Wicklow is a maritime county bordered by the Irish Sea on its east coast, and by the counties of Kildare, Carlow, Wexford and Dublin. It covers an area of approximately 781 square miles (2023 square kilometres). Its length from Bray on the County Dublin border to Clonegal at the southern corner is 41 miles (66km), and its width from Wicklow Head to the Kildare border is 27 miles (43km). One of the main geographical features of Wicklow is the large granite ridge of the Wicklow mountains which runs through the centre of the county. This is part of the largest mass of exposed granite in Ireland or Britain as it stretches from the coast at Blackrock in County Dublin and continues almost as far as New Ross in County Wexford. Two of the highest passes in Ireland run through the Wicklow mountains- the Sally Gap and the Wicklow Gap -–both provide routes to the east and west of the county. The tops of the mountains are dome-shaped due to weathering and erosion over a long period of time. Some of the higher summits such as Lugnaquilla (rises to 3,039 feet and is the highest point of the range) have become denuded as the layer of peat has been stripped away due to harsh weather conditions. The lower ranges would have this covering but would also have areas of heathland. Glaciation during the last Ice Age has left many marks on the landscape of Wicklow. Glendalough, Glenmacnass and the valleys of Lough Dan (671 feet) and Lough Tay (810feet) are striking examples of U-shaped valleys. On the higher slopes can be found some examples of corries. Some of these contain lakes, which formed as glacial meltwater became blocked. Loughs Bray and Lough Ouler are examples of the above. As some of the dammed water escaped it created meltwater channels called glacial spillways .The Glen of the Downs and the Scalp are examples of this. Wicklow is the only county in Ireland not to have a bedrock of limestone but it does have a ground sheet of limestone debris deposited in the midlands after the Ice Age. 1. Brunker, J.P., 1950. Flora of County Wicklow . Dundalgan Press. the Garden of Ireland. Town House Dublin. studies in the Counties of Dublin & Wicklow. Talbot Press, Dublin.